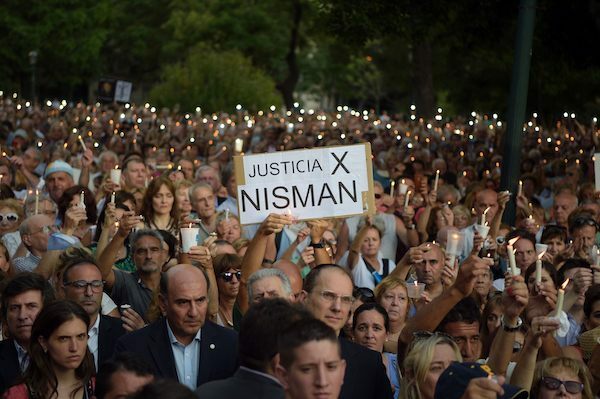 Argentine newspaper Clarín estimates the crowd to have been thousands strong Monday evening at an event organized by Delegation of Israeli-Argentine Associations (DAIA) called “Candles for Nisman.” The vigil served both as a memorial to the prosecutor, as well as a call for the recently elected right-wing government to find those responsible for Nisman’s death and bring them to justice. 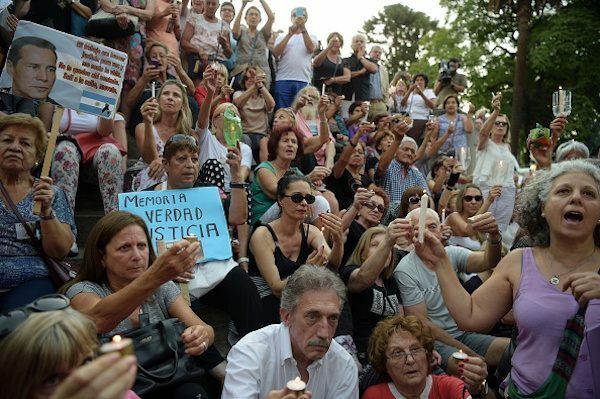 On the one-month anniversary of Nisman’s death, 400,000 Argentines protested his death and demanded the government of then-President Cristina Fernández de Kirchner find those responsible. The prosecutor put in charge of the Nisman case, Viviana Fein, insisted for months before being removed from the post that Nisman had committed suicide. Argentines protested this claim and ultimately took the Kirchnerist government out of power, voting for current President Mauricio Macri over Fernández de Kirchner’s hand-picked successor, Daniel Scioli. Argentines had reason to distrust Fernández de Kirchner. On January 19, 2015 – the day after he was found dead – Nisman was to testify before the Argentine Congress that the President and her Foreign Minister, Héctor Timerman, had agreed to protect Iranian terrorists in exchange for favorable prices on Iranian oil. 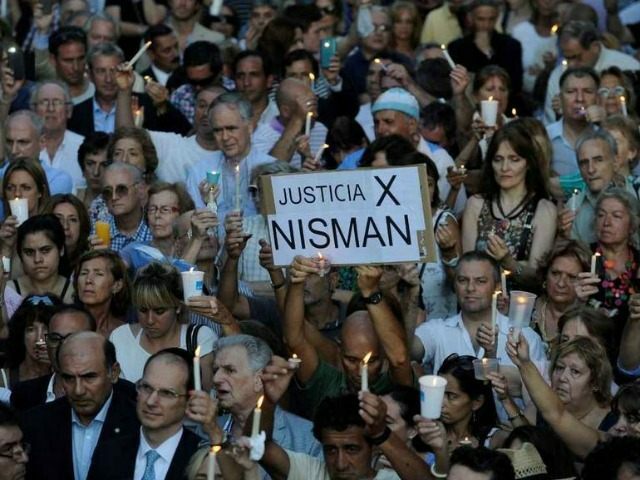 The terrorists in question were those Nisman’s own investigation had found guilty of orchestrating the 1994 bombing of the Argentine-Israeli Mutual Association (AMIA) headquarters, the deadliest terrorist attack in the Western Hemisphere before September 11, 2001. 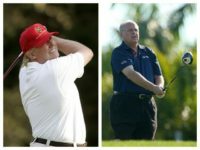 Nisman had drafted an arrest warrant for both Fernández de Kirchner and Timerman before his death. Law enforcement has named no suspects in Nisman’s death, and in the year since his death, Iran has brokered a deal allowing them to access billions in frozen funds and repeal sanctions on their government. 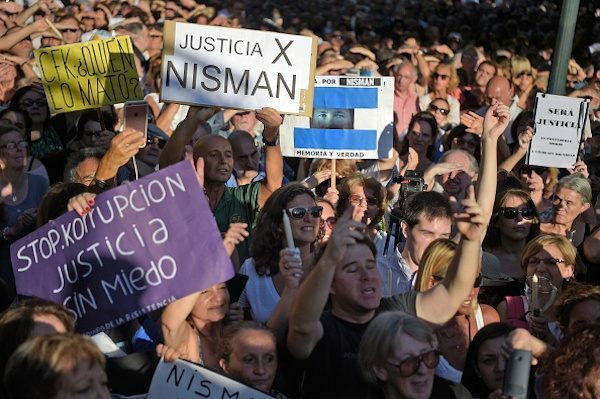 The crowd honoring Nisman Monday evening chanted, “Justice, Justice” for 40 minutes, listening to a series of speakers, including journalists from La Nación newspaper and Nisman family members. Most brought candles with them or lifted their lighted cell phones, creating a symbolic “path to justice” with the light. Macri himself was not in attendance, as he left the country Tuesday to attend the Davos conference, but he announced this week the official declassification of key files regarding both the Nisman case and the AMIA bombing. “Here there will be no cover-up, there is a fierce will on the part of the president to make efforts so that this cause ends with a sentencing,” Mario Cimadevilla, Macri’s hand-picked head of a special agency to investigate both the AMIA bombing and the Nisman case, said this week. “Whether he committed suicide, if he was induced to suicide, or if he was killed, Nisman’s death is related to the AMIA cause,” he added.